Mornings are so chaotic, and getting everyone fed is a challenge. We moms need to get everyone out of bed, dressed, fed, and ready for the day – and there never seems to be enough time to do it all. Cereal often comes to the rescue for quick and easy morning fuel. But it can leave you worrying that your little ones are getting too much sugar to start off the day. Guess what? You CAN rely on cereal for busy mornings, you just need to know the right ones to buy. It can be really frustrating standing in the cereal aisle with a thousand options, while your toddler is whining for something to eat, or even worse, running down the aisle pulling boxes off the shelf all along the way. And a lot of the cereals that LOOK healthy from the front – organic, non-GMO, say “whole wheat” or “bran” or “gluten-free” – can still be loaded with sugar. For example, have you seen Annie’s Cinnabunnies? You can see from the front that they are gluten-free, organic, non-GMO, and “made with goodness.” And Annie’s has a reputation for being natural and healthy. So this looks good, right? But one cup of this cereal has 12 grams of sugar added – which is basically the same as dumping 3 teaspoons of sugar on your kid’s food. And that’s just in one cup! Kids can easily knock back at least two times that amount. Here’s the funny part – it has more sugar per cup than Froot Loops! It’s still good to avoid the artificial colors in products like Froot Loops, so I’m not suggesting you buy those instead. But, it just goes to show you that the front of the package doesn’t tell you anything about the sugar content. The good news is that there are a LOT of boxed cereals out there that have a much lower sugar content. In fact, I looked at hundreds of cereals to find all of the lowest sugar options for you, and I was surprised at how many low sugar options I found. Serve it with milk to increase protein. Okay, this is kind of obvious, since most kids do eat cereal in milk. But for your younger toddlers who haven’t quite figured out the spoon-to-mouth instead of spoon-to-floor thing, you can offer milk in a cup. Or lightly cover the cereal with milk to soften it. They can still eat it with their hands, but there’s not a ton of milk spilling around. Or, try an alternative to milk. You can also try yogurt with cereal on top, or a non-dairy milk or yogurt option. Just check to make sure your non-dairy choice has a few grams of protein, because many of them do not. Make a breakfast trail mix. If you don’t have time to sit down for breakfast, pour some of their cereal into a snack cup with raisins and sliced or chopped nuts to add more calories, fat, and protein. Serve it with fruit. Fruit is just as easy to grab as cereal, and adds both vitamins/minerals and fiber. It can also add the sweet taste that your little one loves, without any added sugar. Serve fruit on the side or on top of cereal. A lot of moms are nervous to shift away from the cereal their kids like. They are worried that their kid won’t like the new kind, and that they will throw a fit. Gosh, kids are so easy to deal with sometimes, ha! If your toddler is young, or still a baby, you are in the easiest position because they likely have not tried the sugary stuff yet. That means you can get them used to the non-sweet kind, and they will probably be very happy with that. If your kid is a bit older, and has tried some of the sweeter kinds, they might push back a little bit when you decide to switch to lower-sugar. Here are some ways to make the transition easier. Dust some powdered sugar on top of unsweetened cereal. 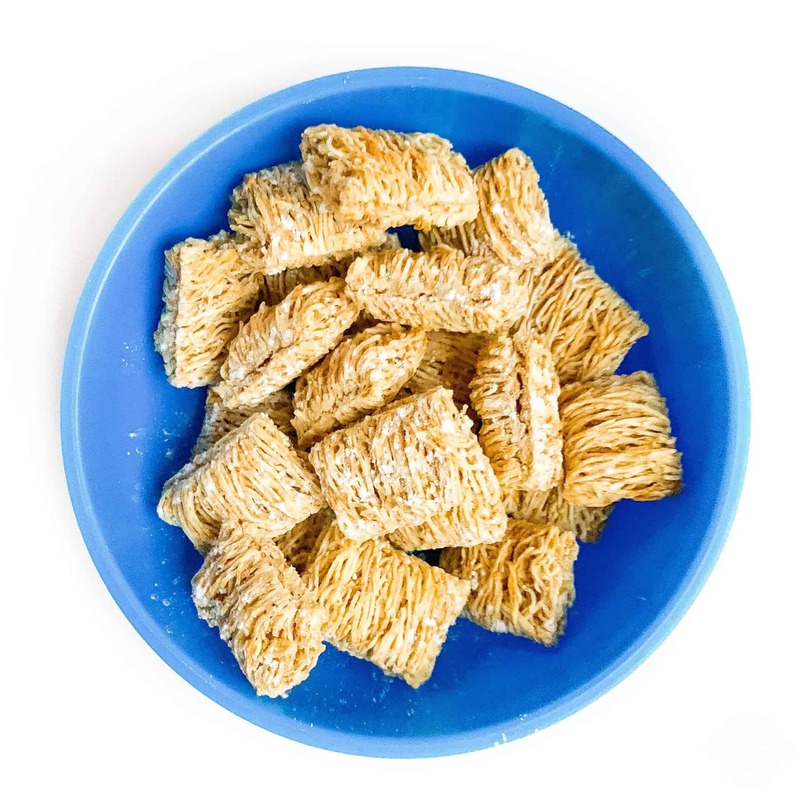 Shredded wheat (0g sugar) with a few shakes of powdered sugar on top becomes just like Frosted Mini Wheats (11 g sugar), but you’re only going to be adding 2 or 3 grams of sugar. Add fruit on top. Either fresh fruit, or dried, like raisins, help add sweetness without any added sugar. Every cereal in this guide has 6 grams of sugar or less per serving. I recommend going with the lowest sugar added that your kid will still eat! Most of the cereals on the list are not specifically “kid” cereals, and that’s for good reason. Did you know that most kid cereals have more sugar than cereal marketed to adults? That’s messed up. Our kids do not need any more sugar than we do. The Guide separates organic vs. non-organic options, and lists out products by brand. I also tried to list them in order from lowest sugar to highest. There are gluten-free options on here, but I didn’t call them out, and I’m sorry! I only remembered about halfway through my search to denote the gluten-free options. So yes they are on there, you’ll just need to check labels to find them. Need more help with mornings? These Breakfast Menu Cards have been a lifesaver in my own house, and I hear the same from lots of other mamas. I created these to avoid breakfast battles, and they really work! Check them out here. I’m a mom of two and a Registered Dietitian Nutritionist. I offer nutrition counseling, workshops, and freelance writing. Check out my blog for nutrition tips and family-friendly recipes. Thanks for being here! How Much Dessert Should I Let My Kid Eat?